It was all good times for good causes this Sunday, at the Newport International Polo Series third annual All Charity Day, a special highlight of the 27th season. Over 2,000 supporters of 24 civic and charitable organizations turned out for an afternoon of exciting polo action, enticing raffles, heated silent auctions and more. This year’s beneficiaries included Alzheimer's Association - Rhode Island Chapter; Boys Town New England; Community String Project; The Confetti Foundation; Greenlock Therapeutic Riding Center; The Junior League of Boston; The Junior League of Worcester; Newport County YMCA Special Olympics Team & Adapted Physical Activity; Newport Hospital; Portsmouth Public Library; Providence Singers; Rebuilding Together Greater Newport; Rhode Island Federation of Garden Clubs; Rose Island Lighthouse Foundation; Suzanne M. Henseler Foundation; Team Red, White, and Blue; New England Hemophilia Association; Horses Bring Hope; Brain Injury Association of Rhode Island; Boys Town New England; San Pancho Animales. All proceeds from ticket sales went directly to the organizations, raising over $22,500 (totals still coming in) for the participants. Spectators were treated to an incredible intraclub match between local Newport players, plus activities hosted by the 22 charities there. Everyone wanted to join the raffles for a chance to win one of the many awesome gift baskets that were available, and place their bids in the silent auctions. The New England Hemophilia Association sold raffle tickets for the chance to win extravagant prizes, such as two round-trip tickets on Jet Blue, a VIZIO HD/LED Smart TV, a 9.7' iPad Pro 23GB with WiFi, and a Bose Soundlink Bluetooth Speaker. The Newport County YMCA held a raffle and awarded a lucky winner with $100 worth of lottery scratch tickets. The Portsmouth Public Library also hosted a raffle for numerous summer themed baskets, from fishing to summer happy hours. A silent auction was held by the Rose Island Lighthouse Foundation, with incredible auction items such as totes, wine glasses, International Tennis Hall of Fame court time, a Rose Island Lighthouse & Harbor tour, and more! There was so much to do and see, and for most it was their first time witnessing a polo match. Representing the White Team, in position #1 was Roger Souto, with Margaux Buchanan playing #2, with Minnie Keating at position #3, and position #4 was Amy Rice. Representing the Red Team, in position #1 was Clarke Curtis with Bridget Torrey as his alternate, in position #2 was Laurel Howe, with Patrick Quigley at position #3, and in position #4 was Jenna Davis. Although Souto put the White Team on the board first, the Red Team was able to gain their own momentum and take the victory over their opponents 7-4. Through its 27 year history, Newport Polo has raised over $1,389,380 for civic and charitable organizations. 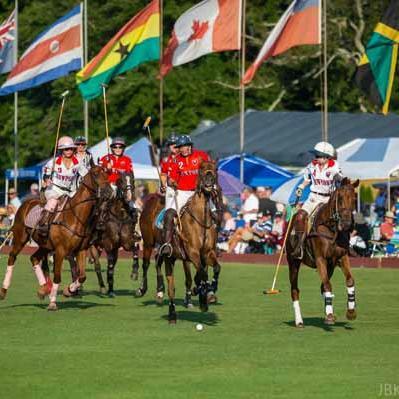 Initiatives include the International Polo Charity Ball, special benefit matches, and countless ticket donations for the Newport International Polo Series.